My first job was at Knight’s Ice Cream in Clintonville. I started as a sophomore in high school and left the summer of my senior year. I made $2.85 per hour to begin, my top salary was $3.50. It took a long time to save for a car. The job taught me a lot. A lifelong love of ice cream began. I discovered I liked food…well I obsessively loved it, actually. I observed that a cup filled with ice and pop dumped in a trash is not cool. Since that discovery I never dump anything with liquid in a trash can because I know what it is like to clean up the mess. I found I was not good with down time on the job and would seek out something to do. I never lost the restlessness – but I am trying really hard now. In the winter when it was slow and I was working by myself, I started to experiment with everything we had in the shop – ice cream combinations, Sprite and sherbet shakes, chocolate covered anything, intriguing sandwich combinations and etc. I still engage in some reckless culinary experiments. The job laid a foundation. I found I was a shy kid that enjoyed interacting with people and getting to know their preferences to make sure they got what they needed. One lady came in every Thursday for a scoop of coffee ice cream. I gave her one on the house after a year of repetition, she was shocked as if she had never been treated before, maybe she had not. Another customer came in every Saturday at 4:45 pm or even closer to the 5 pm switchover. He ordered five milkshakes of various types. It was always busy when he ambled in. The multi-shake request messed up the flow of our shift change. It briefly ticked me off. I discovered he was giving the shakes to his buddies at my favorite hobby shop. I then saw his act as generosity and that changed my mind and my attitude. The work I have enjoyed the most has included a lot of social interaction with new people, an opportunity to be creative in some way and autonomy. I miss that. I need that. The work I enjoyed did not feel like work….I know that is a rare thing for most people. I enjoy finding and making a connection to an idea or a person or at least giving the world something useful or entertaining. I had micro-bursts of food service over the years. I volunteered for several food events: wine bartender at ComFest for years, my hot dog festivals and chili parties were famous in their day, washing plates at countless events, my Pizza Grand Prix series. Last summer I grilled 100 hot dogs for the masses at the Goodale Park Music Series. I enjoyed educating people about hot dog history and styles as they waited for their order to grill up. 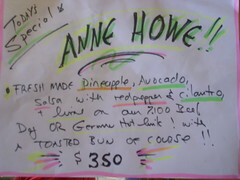 I have written about food since 1999 but only from the diners side. I felt an urge to get on the “right” side of the counter. I’ve been a fan of O’Betty’s in Athens for years and a fan of hot dogs even longer. 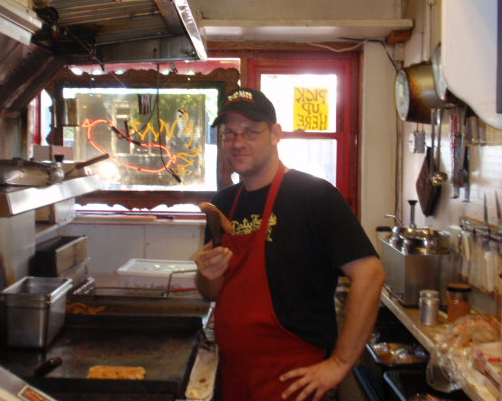 I came to know owner Bob Satmary over many hot dogs and chats about the Athens food scene. I think O’Betty’s is the best hot dog shop in the state…maybe the Midwest. I needed to balance out my perspective by getting behind the counter again. I asked Bob if I could work pro-bono to get my serving legs back. He said sure, come on down. I arrived on a Saturday morning at 11:00 am, ready to work. I donned an apron then got the lay of the land behind the counter. 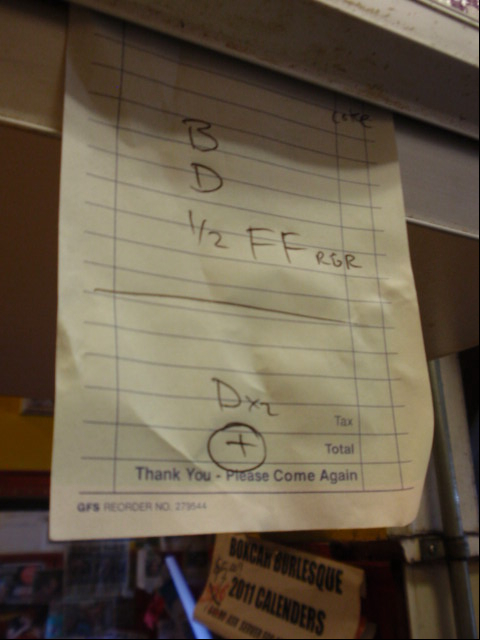 The space in the place is small with no room to nudge past each other – single file from the grill to the cash register. 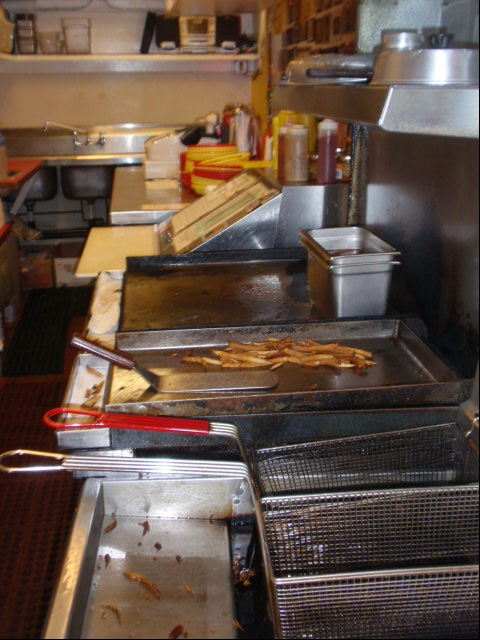 My orientation covered how to make the best fries in the Ohio, the secret to serving a tofu dog that is worth eating and with a bit of trial and error how to create the various O’Betty’s hot dog varieties as well as how to redo a few mistakes I made along the way. Bob was a patient and effective teacher. During a couple slow periods I had a chance to speak with a few of the customers. Two guys on scooters from Ann Arbor were traveling around Ohio following places they found on Roadfood. I wrote two of them – O’Betty’s and Starliner Diner. I gave them a list of six places in Columbus for dinner. Another gentleman from Manhattan, currently working in Marietta, sang praises of the Athens and Columbus food scenes. I agreed and gave him a lot more food for thought and consumption in the capital city. I also made him a “Dixie” to go which he felt passed muster. 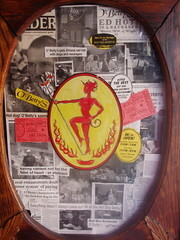 O’Betty’s customers are almost all regulars and become part of the family in a short period of time. Photos of the favorite “family members” can be found on the wall opposite the register. I did some cleaning and some prep. More hot dogs were grilled and buns steamed. I made one for myself and enjoyed the end result very much. I was told I did pretty well for the first day and had a job if I needed one! Knowledge confirmed: Hot dogs are best held in a hot water bath before grilling, fries are best soaked, blanched, then fried, customer service is the key to any business, when you connect with the customer everything else falls into place. My payment was a cookie and an afternoon of learning about hot dogs as well as rediscovering a lost part of myself. Writing is best and easiest when writing of a subject you love. It is another thing, but good to write about something you do or have done (unless it is something soul sucking). I was back behind the counter. I may be back at O’Betty’s for a shift or two this fall (but not Halloween – sorry Bob). I may be at another restaurant or bakery near you doing the same thing, providing the perspective from the other side. 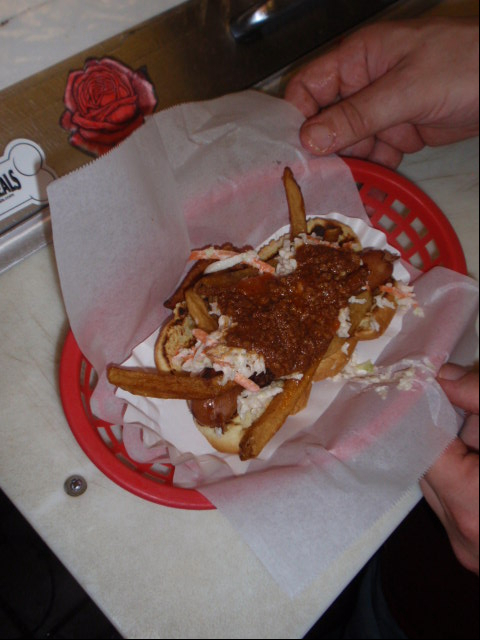 Readers of CMH Gourmand know one central truth, O’Betty’s is the greatest Hot Dog shop in Ohio. As part of my holiday tradition this year I went to the Los Potosinos Taco Truck for Christmas Eve lunch, Little Dragons Chinese restaurant for Christmas Eve Dinner with CMH Mom and O’Betty’s for a bacon and slaw hot dog surrounded by the ambiance of the 3D Jesus Display. Athens is a special place where different worlds live in harmony. Students and academics live in proximity to locals that have been in the area for generations. Deer Hunters and Vegans pass each other on Court Street without a blink of the eye. There is a mix of conservatives and liberals, right wingers and hippies but the end result is a tight community. In December, there is a shift the the town. College kids leave at Thanksgiving and don’t come back until the near year. The seasons change and things slow down. At O’Betty’s the gang goes all out the make the downtime a good time. This year customers could get two quarters for the meter if they needed it. Back by popular demand for the third year in a row was “The Life of Jesus in 3D”. 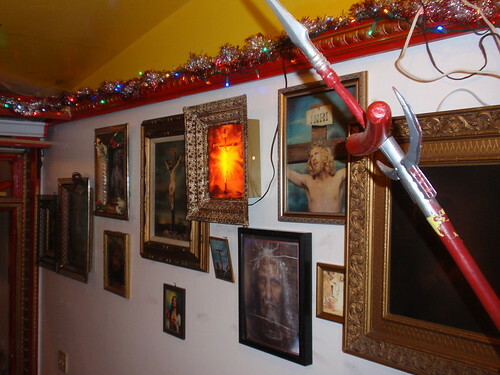 The hot dog museum in the back of O’Betty’s is transformed into the Gallery of Fine Contemporary Culture. 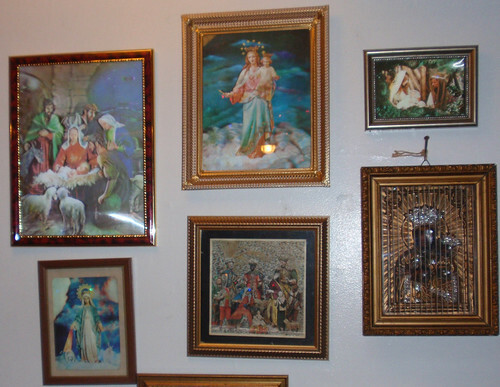 The portraits of Blaze Starr and Betty Page come down (well most of them) to be replaced by thirty vintage lenticular photographs and images of Jesus from the 1940’s, 50’s and 60’s from across the world. A tri-fold pamphlet full of information about the images and the history of the technology that created it is provided for visitors. The development of 3D images from the 1930’s to the present is described in detail. Leticular images were ubiquitous in the mid 20th century. The technology was used in campaign buttons, ads and record albums. Many of these examples have disappeared however this collection serves as an education and was preserved because, well, you can’t throw Jesus away. The images are amazing whether you look at them from a religious, pop culture or technological perspective. So like I said, in Athens, different viewpoints come together and survive the convergence. I’ll go for a hot dog, fries and a side of culture any day. However in this case, you are out of luck. The exhibit is around for December only. Maybe you can make a journey to Athens next year to make this part of your own holiday tradition. This is somewhat recycled content but I just returned from two days in the Athens area and I wanted to make sure I gave O’Betty’s its due. So here we go. Of the many things that connect my soul to Athens county, the strongest is a hot dog shop. 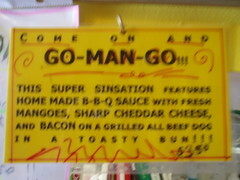 Well, not just any hot dog shop – the best ever, anywhere. 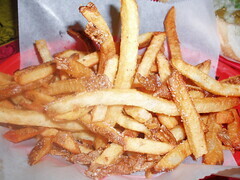 O’Betty’s won the dining hearts of Athens since it opened in 2003. It has been voted best Hot Dog most years since 2004. The hots dogs names, decor and vibe are inspired by burlesque babes from the first half of the 20th century. The hot dogs are 5 Star all beef dogs with a natural casing (one of the best commercially available hot dogs in the country). 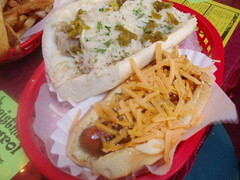 There are twelve “varietease” of dogs including a create your own style and tofu dog for vegetarians. If you want a Chicago style dog – go with the Salome – “Dance of the 7 Veils” – sport peppers, sweet relish, pickle spear, diced tomatoes, diced onion, Stadium Mustard, and celery seed. Many kinds of toppings are available as well as salsas from Casa Nueva, baked beans, mushrooms, and on occasion, homemade corn relish and pepperjack cheese. When possible all topping are locally produced and sourced. The dine in area accommodates about 16 people. On a Friday or Saturday night expect long lines of college students outside O’Betty’s waiting for their chance to get the perfect hangover food. 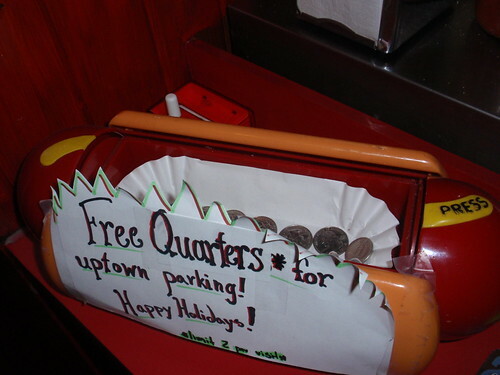 Another bonus of O’Betty’s – the in-house Hot Dog History Museum / Weiner Hall of Fame. 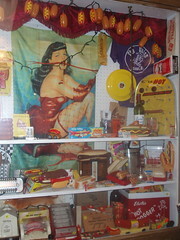 The items in the collection were amassed by Bob Satmary and are continually added to by customers. 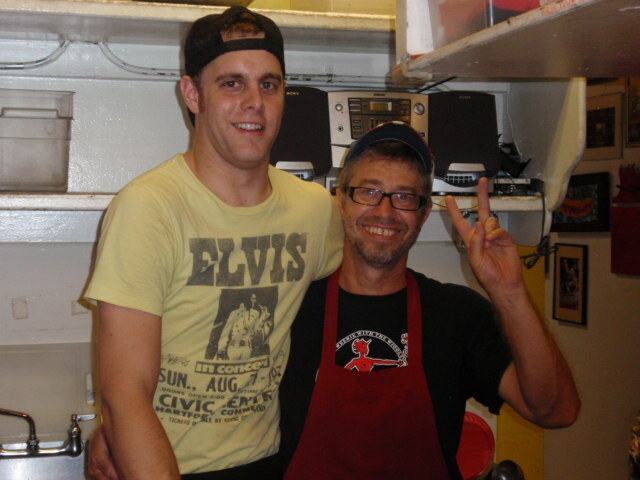 Owners Bob Satmary and Ryan Stolz enjoy what they do and clearly put service and fun first for the business. They are always chatting it up with their friends/customers. And they like to mix things up as well. In the winter – expect some tasty soups to keep warm and all year long expect special hot dog combos to keep things hopping (last one I experienced was a Mango BBQ sauce dog with bacon – yum!). And in August of each year, Bob and Ryan celebrate all things hot dog culminating in a hot dog eating contest which I wrote about earlier this year. 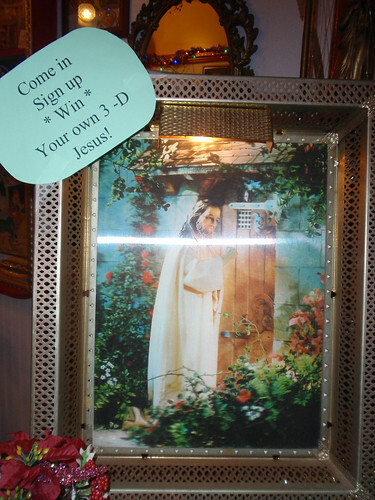 If you are very lucky, during Christmas week, you may have an opportunity to see the display of 3D Jesus items from the 50’s in the back room.